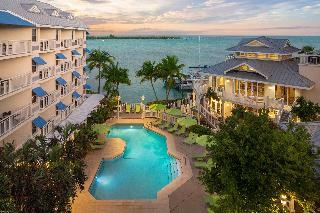 Key West Marriott Beachside Hotel is a destination in itself on this legendary island. One of the few hotels in Key West on the beach that is a member of the Florida Green Lodging Program, the resort is set on seven-lush acres with a private tanning beach and waterfront pool. The Key West beach hotel's ideal location provides travelers easy access to all the arts, history, local flavor and non-stop merriment that the island has to offer. Enjoy contemporary dining at Tavern N' Town, casual dining at the poolside Blue Bar, high-speed internet and a top-notch fitness center at the beachfront hotel in Key West. Nearby you'll find the Key West Golf Club, scuba, snorkeling, sailing, jet skiing, kayaking, waterskiing and nature trails. Take the Key West hotel's complementary downtown shuttle to experience everything Key West has to offer and return to paradise at the Key West beach hotel. Located right on the waterfront in the heart of the old town on Key West, just one block from the attractions of Duval Street and Mallory Square, this luxurious beach hotel is an oasis of peace and tranquillity. Bicycle and scooter rentals are available nearby, and the Key West International Airport is just a ten-minute drive away. Reflecting the charm and character of Key West while portraying sophistication and luxury, all rooms include private, furnished balconies, plush bedding and state-of-the-art technology such as Wi-Fi internet access, iPod docking stations, and flat-screen televisions. Many rooms also boast views of the Gulf of Mexico or the old town. The onsite restaurant serves succulent grilled seafood and steaks, and the bar offers casual meals and a laid-back atmosphere to take in views of the glorious sunset, altogether making for a fabulous island retreat for couples and families alike.